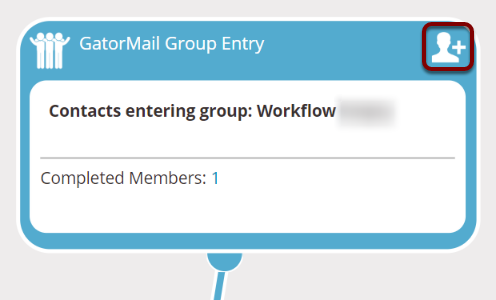 Prior to setting a Workflow live you are able to test the process by passing one or multiple email addresses through the Workflow. This is recommended for every Workflow you plan to use. 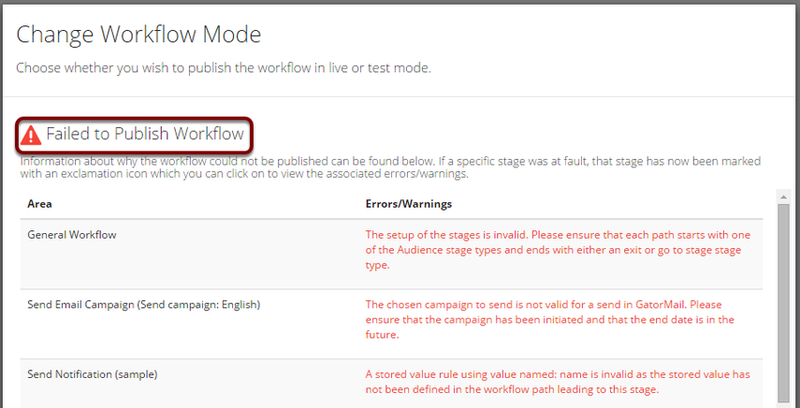 The email addresses that are used to test, are added to the Workflow save screen. Please see Saving your Workflow and changing its details. You are also able to advance members through the Workflow in order to bypass wait periods. In order to test your Workflow successfully you need to add your test email/s you wish to use. There are two options in regards to testing your Workflow. 1) You MUST have your email in the 'Test Email Address' field within the 'Update Details' tab, AND you must add the same email address as a Workflow member with the icon shown in the screenshots above. 2) You MUST have your email in the 'Test Email Address' field within the 'Update Details' tab, AND in the Live Audience group used for testing. Use 'Go To Analysis' to access the buttons specified. Select 'Test' from the dropdown that appears. The above screen will appear to confirm the mode the Workflow has been published in test mode. This means that all test addresses will be accelerated through the Workflow and receive communications. 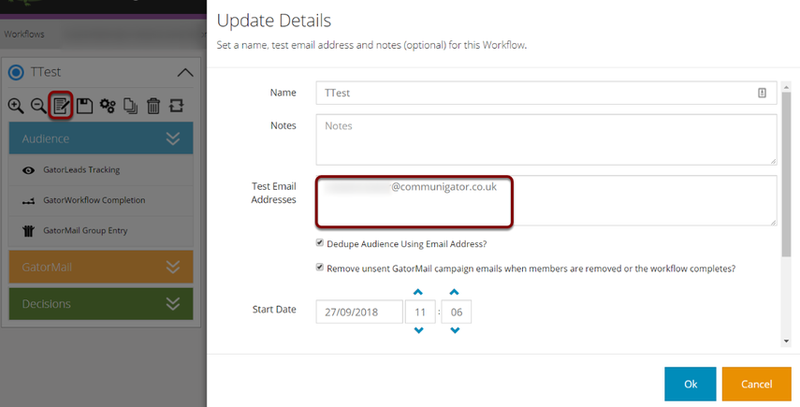 As well as sending the test email addresses the communications within your Workflow, you can run through the analysis in order to see the stages that test members access and complete. Please ensure you have entered you email address as a test email address in the ways specified in the 'Add your Test Email' section in this article. Failure to do so will mean your Workflow can't be tested. Each stage will show the number of members that are currently within that stage and the number of members that have completed the stage and moved. Click on the number to see who the members are or advance members to the next stage. Wait periods will be honored throughout the test period, so a manual process of advancing members through a wait or other stage can be carried out in order to speed up the test process. You can do this by clicking on the active members number of the stage, which will display the above screen. Once a test member reaches the end of the Workflow, the test is complete. If you would like to repeat your test, the member will need to be removed from the members tab. Removing a member will remove them from all stages and start them at the beginning of the Workflow. Click the 'Actions' dropdown list. Select 'Remove Member (allowing re-entry)'.